Wait: The transport simply waits for a specified number of seconds to elapse. 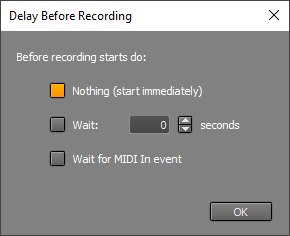 Wait for MIDI In event: The transport waits for a MIDI Note or Controller event on the MIDI In port. This works for audio recording as well. If you have a MIDI sustain pedal you can use this to start the transport. Any channel on the MIDI In port can be used to start the transport. Note: the settings are used only if there is at least one track in record mode.